BEFORE the 2002 grand final, in which a valiant Nathan Buckley would win the North Smith Medal in a narrow loss to the Brisbane Lions, there was a slogan written on the walls of the Collingwood rooms. The words, consistent with Collingwood's defiant mindset under Mick Malthouse, seem pertinent today: "Those who have invested the most are the last to surrender." 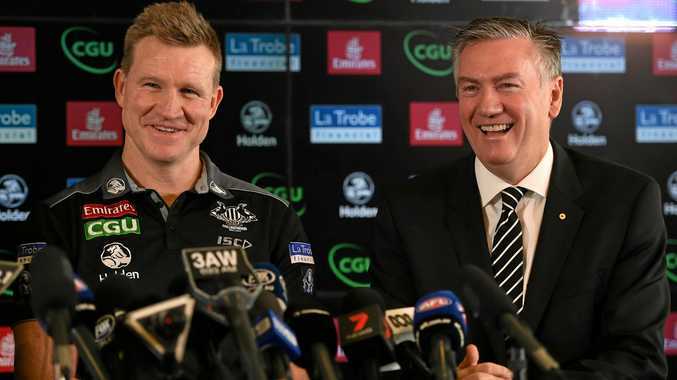 The Magpies, and especially Eddie McGuire, have invested so much in Buckley as coach that they are unwilling to do what nearly every club would have done with a coach who has finished 11th, 12th, 12th and 13th over four seasons. Buckley, for his part, also has invested so much in coaching his club - which the Pies seem more than ever today - that he wants to keep going, believing and hoping that it will turn around after six years of decline and, in 2017, stagnation. Perhaps it will turn around, but the renewal of Buckley's contract on Monday is a call that is difficult to justify, even if it has the imprimatur of a seasoned, sage football director in Geoff Walsh. McGuire has certainly been at pains to say the board followed the Walsh recommendation. It is a decision that won't buy the Pies the commodity they need most urgently, even more than a tall forward and defender: time. Consider what will happen if the Pies struggle in the early period of 2018. They and Buckley will be operating in another siege and McGuire will be on the back foot, given that Walsh's review of the football division has found that Buckley, like Damien Hardwick 12 months earlier, needs better support. Once support staff have changed - mainly in the coaching panel - there will be no other parties that can be changed around Buckley, who, after his second season, embarked upon an unsuccessful attempt to engineer "cultural change" in the playing group. The major casualties of that pogrom were Heath Shaw and Dale Thomas. The latter decision was clearly correct, but the Shaw axing has been shown to be ill-advised, particularly since it was followed by the unwelcome exit of Shaw's close mate Dayne Beams, who left, in part, because he did not like the Buckley environment. Had the Pies moved Buckley on, they would find it easier to press the reset button. The new coach would be given more time and thus more opportunity to take a longer-term approach, without worrying about job security or the mounting pressure on the regime. A new coach could take a fresh look at a playing list that has either not reached its potential under Buckley or been overrated by the club - as the Pies virtually admitted on Monday - or both. Collingwood, of course, can argue that this reset will happen under Buckley, as it did for Hardwick, with new personnel brought in enabling them to "make Collingwood great again", as Eddie Trumped. Hardwick, though, had taken the Tigers upwards and his annus horribilis of 2016 was an anomaly, since they had played in three finals series before the downturn. He had more credits in the bank. Another argument one hears for the Buckley retention is that the coaching marketplace is pretty thin and they're better to stick with the devil they know, in this case a man of great decency and character. This is perhaps the worst of all of the reasons for keeping Buckley. Adelaide has twice found good coaches from the ranks of little-known assistants within 12 months and if you never venture into the untried market, you will never land a Beveridge or Clarkson without paying squillions. Collingwood argues that it has a developing team - which is fair enough, except that it deviated from that game plan when it brought in Daniel Wells and (inexplicably) Chris Mayne on hefty three and four-year deals that have consumed a sizeable portion of a salary cap that has consequently much less room than it should. The club's rationale is that it had stripped back and lost so much experience that these veterans (plus the better value Lynden Dunn) were necessary. One would hope that these short-sighted deals were not about Saving Private Buckley. 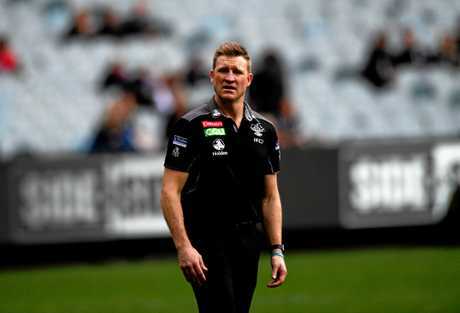 As the club acknowledged on Monday, Buckley has been let down by Collingwood, which gave him five heads of footy in a short timeframe and has not provided him with the right support. 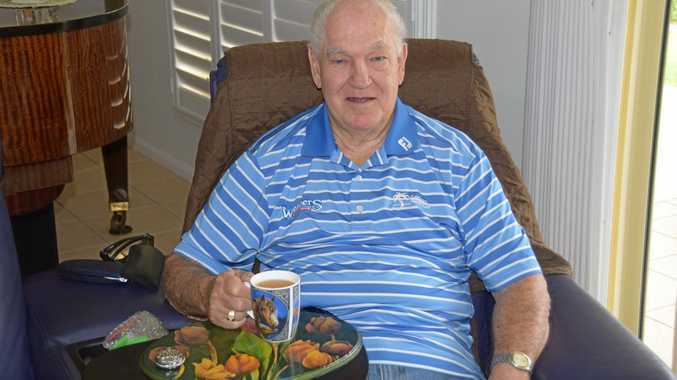 That said, the coach has not acquired any Hawthorn intellectual property and when the Hawks were hiring teachers and no-name players who had coached their own teams (and who now coach AFL clubs), Buckley had a retinue of former teammates and decorated players in his panel. The buck should have stopped with him, and his tenure ceased. That it hasn't isn't really surprising. Collingwood is another country, as L.P. Hartley said of the past. They do things differently there.